On the cover of her new album Okovi, Nika Roza Danilova peers out from under a thick swathe of viscous, black gunge. The substance smears and spatters, enveloping her head to the point that only her eyes are visible. Where a syrupy darkness covered her entirely on the cover to her 2010 EP Stridulum, the intent gaze here suggests an understanding rather than oppression – she’s not controlled by it, she’s empowered. In the three years that have passed since her last album Taiga, the mind behind Zola Jesus has become tragically but intimately attached to pain and sadness – and found a way to survive in its depths. Okovi builds an intricate structure of heavily textured layers, cavernous wailing, icy percussion, and strings so sharp they could slice your heart in half. Danilova knows a thing or two about the rebuilding process, having returned to build her own home on her family’s land in Wisconsin after some time battling depression in Seattle. Okovi translates to shackles from multiple Slavic languages, and feels bonded to both her past and the roots of her pain. The home the album builds shrinks around her, pulled close to encircle, inspect, and define the various pains: her own depression, a friend’s attempted suicide, another loved one’s cancer diagnosis, and more. But when the smack of a drum or a pained howl shatters the walls, it acts as an all-too familiar reminder that even that clarity can be shattered, that everything must be broken and dismantled – in order to be built again. Another part of that building involved constructing the album more collaboratively than she had in the past. “I invited people in more than I have before and gave them creative liberty,” she explains. Though created in part to hash out the fog of her own inner world, Okovi so eagerly connects with others, her attempts to fulfill and be fulfilled. It grabs from all the genre touchpoints Danilova’s worked in the past (industrial, opera, electronic, noise) to produce something incredibly substantive and whole. “I kept reminding myself that in the end all art and all creation is intuition and the digestion of experience,” she says – fitting, as Okovi is some of the most fulfilling musical sustenance 2017 has yet to offer. 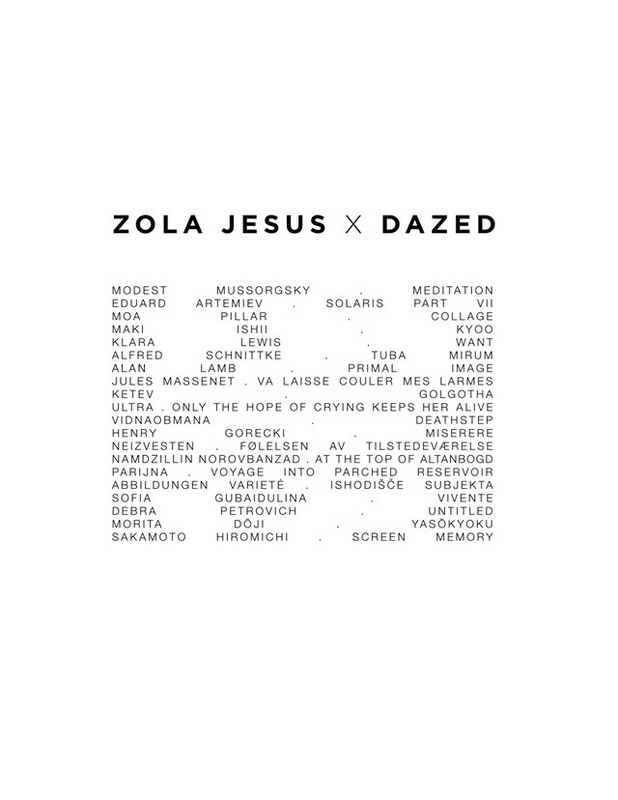 Zola Jesus’s Dazed Mix spans an equally wide range of genres and styles, while also embodying that same tension of building up and breaking apart. The obsessively curated set of tunes draws in large part from the music Danilova listened to while building Okovi. It darts nimbly between grinding noise and heart-wrenching operatic vocals, unity and destruction, growth and decay, all while fitting seamlessly with her music. Listen to the full mix below, and read on for an interview about the intense emotion and experience behind Okovi. Taiga represented a boundlessness, from a place that reminded you of where you grew up, something that wasn’t touched by humans. Okovi basically translates to the opposite, of being bound to something. Zola Jesus: That was a big problem that I was going through while making this record. First I had to come to terms with my own demons, and then I needed to help someone come to terms with theirs. I needed to be in a place where I could at least come out of myself. So many songs on the record were written at different stages when nobody could get through to me. I couldn’t get through to anybody, let alone myself. There were periods when I came out of it but other people around me were suffering. And it was me trying to go, ‘Look, I just went through this, and now I’m on the other side, and it’s okay, and I’m trying to map things out.’ It’s hard. The dichotomy between Taiga and Okovi wasn’t conscious, it was just the lineage of my life. When I made Taiga, I was feeling one thing, and then everything broke down. I think more than any record I’ve made I took the external world out of the equation in terms of the implications of this music, whether perception or what would happen when it hit the world. I needed this music, you know? What comes out of the body when you work like that? 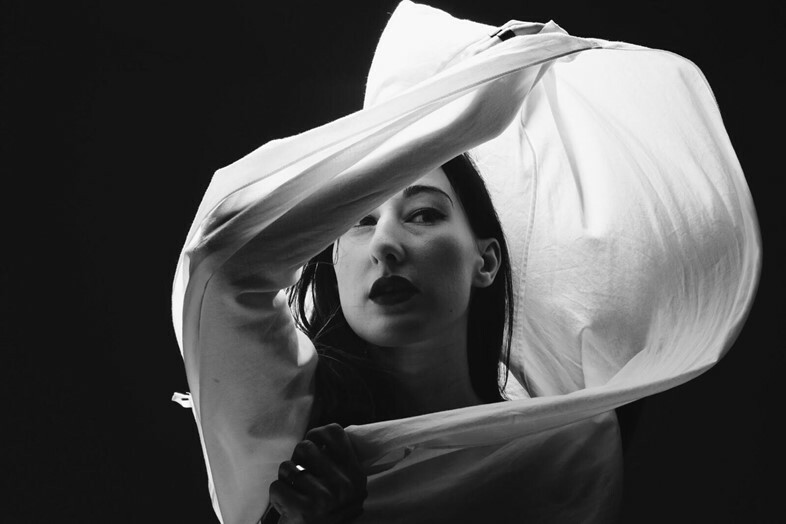 Zola Jesus: There was probably a year when I didn’t write a complete song. Feelings of just being blocked emotionally, because I wasn’t even in a place where I could let myself be because I was so broken inside. Nothing was working and I desperately needed to stabilise so I could write, so I could find happiness, so I could find peace. I moved back home, built a house, and redeveloped my roots in a place that allowed me a sacred space where I felt like I could finally confront what was happening inside and around me. I didn’t have the utility of music to cope because I couldn’t even write a song without hating myself. You just feel so emotionally disabled. I can only imagine. That implies that you think of exile as spiritual as well as a physical condition. When you needed to go back home, you went back to nature for familiarity in an unfamiliar experience. Zola Jesus: Exactly. I couldn’t think about things in an objective way, I just had to follow my intuition. I needed to do this in order to heal, and I’ve been learning to trust my intuition because in the end that’s all we have and that’s our bodies. Even if we don’t have the agency to understand it or figure it out on our own, intuition is really all I had. While you were exploring the interior life of people, did that make you feel as though you were gaining traction? Zola Jesus: When I was writing these songs it never felt like I was getting closer to something. The more I wrote, the further away I was from understanding. Up until the end, I would just be broken on the floor going, ‘I don’t have anything, I don’t have anything!’ It didn’t feel like something that the world wanted to hear. Then I got to the point where I finished it and everything came into focus and I realised that that whole process and struggle along the way was what the record is. It’s about embracing that confusion and frustration, letting that be the scope, letting that be the language for this music, and not having it be any sort of declaration of clarity. Can your voice be an empowering mode to get yourself out of that? Zola Jesus: If I’m at my lowest, nothing works. But there is a tiny rip in the haze and you feel like you can go through it, and, physically, my voice has always been a means to release. It’s always been therapeutic. And the more I have to work through, the more I lean on my ability to write or to make music because that’s what I use in order to create a picture of what I'm going through. On ‘Soak’, in the second or third minute, your voice cracks, and on ‘Remains’ you hit a higher range in your vocals which is utterly devastating. Zola Jesus: There is an aspect of my singing that I let go of. It’s this freedom and elasticity that I had when I was younger, because I was trying to control my voice too much. I don’t know if it’s because of what I was going through or because of wanting to access my full voice and being okay with it breaking, or okay with it going places that I didn't have control over. But I’ve been trying to embrace all colours of my voice, even if they’re not ‘classically technical’, which is something I struggle with, having been in opera training for so long. Yeah. (Sighs) That’s a whole other thing, because so much of how I sing is coloured by the fact that I yearn for technical proficiency within a classical or operatic context. When my voice breaks, even because of emotion, I resent it. There’s a real depth of field on this album that feels very immersive. A headphone-ness about it. How do you blend those abrasive, industrial sounds with traditional melodies whilst also tackling things that are inherently personal? Zola Jesus: I think I got lucky! (Laughs) Making these songs and then dressing them with my co-mixer and co-producer Alex DeGroot helped. We rented a house up in northern Minnesota in the winter and were there for two weeks. We gave the songs the life that you hear now, and I just kept saying, ‘Visceral! More immersive! You need to feel it.’ I needed what I was saying to feel like I was feeling. Everything I’m going through on these songs is so intense and cathartic for me that I needed to communicate that musically. It took a lot of destruction to make this. It feels that way. I felt consumed, beaten up, hugged, thrown around, moved. Was there a genesis for the album? Zola Jesus: The first song that I wrote was ‘Wiseblood’. I wrote it a year ago when I was close to coming out of my haze. I was still in it, it was a song to myself. I had written it when I was still living in Washington, and for me it felt like it needed to be on the record because it was another part of the story. And then after I wrote that, things started clearing a little. As much as this record sounds like it’s about other people and your reaction to what’s happening in their lives, it’s also really about you finding clarity after depression. Did you have a relationship toward death? Zola Jesus: So much of the ‘death’ on the record was experiential. So much of this record is a snapshot of what I was going through at the time. Especially when it’s somebody outside of yourself, you need to be strong for them, but you also need to find your own space to go through things internally. You know? That moment where you need to split yourself or sever yourself and go, ‘Okay, I’m going to be strong for this person, but I also need to find a space where I can work this out because I don't even know how I feel about this person.’ Death felt like a sounding board. Love and pain are kind of interdependent, so it makes sense that you reach out to help, but it’s only really possible if you can open yourself up at the same time. Had you dealt with death before? Zola Jesus: It’s something that I’ve thought about a lot. It’s often at the forefront of my mind and of my experience in life. The last few years have felt so destabilised, and then having people around me (who) feel similarly just completely threw me. Even though I’ve worked through some of these things on my own in the past, it’s like any time you face trauma: you’re forced to readdress your own defense mechanisms, your own survival instincts, and your own principles, and it was just this perfect storm. How do you feel now? I know that’s the strangest thing to ask at the end of an interview. Zola Jesus: (Laughs) I’m usually prepared for this part of the journey more. But this is my livelihood, this is my career. I’m a professional musician, so people are going to ask me questions about it from a strategic standpoint. ‘Did you mean for it to be less poppy or more?’ No! I didn’t think about that! I’ve already been asked questions like that, but for this record it's not subjective. You know what I mean? It’s subjective in that it’s a very emotional record, but I’m giving no power to criticism now. I’ve already got everything out of this record that I need. I can’t give any power or credence to criticism. For me this record is so much more: it’s food. It’s tricky trying to navigate that, but I have a very specific and closed relationship with this music and it’s impenetrable. Thank you for listening to the record – I feel like you’re treating it well, so thank you. In that respect, I feel at peace.